A child has outgrown a booster seat when he or she reaches the upper weight or height limit, or when the top of the ears is above the back of the vehicle seat, headrest or high back booster. Your child may not yet be ready to move to the seat belt alone. A different booster seat may be needed. The key to using a seat belt safely is positioning. A lap and shoulder belt offers better protection than a lap belt alone. The shoulder belt should be in the centre of the shoulder and chest, and the lap belt should rest on the upper thighs. If the belt is not worn correctly, a child can suffer brain or spinal injury, or damage to vital internal organs in a crash. 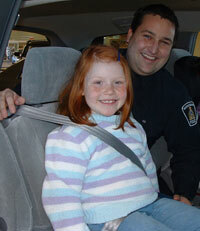 A child should use a booster seat until the vehicle seat belt fits correctly. Provincial and Territorial legislation differs. Check your regulations as to what the law is for anyone transporting children. It is not safe for a child to use the seat belt alone until all six (6) of the points below are met. A “No” answer to any of these questions below means your child needs to use a booster seat to travel safely in your vehicle. Is your child 9-12 years-of-age? Until 9 or 12 years-of-age, a child’s hips are underdeveloped, making it difficult to maintain correct lap belt positioning over the upper thighs. Is your child at least 1.45 m (4 ft. 9 in.) tall? To fit most shoulder belts, both safely and comfortably, a child should be at least 1.45 cm (4 ft. 9 in.) tall or have a sitting height of 74 cm (29 in.). Can your child sit back against the vehicle seat with his or her knees bent comfortably at the edge of the seat, feet on the floor? If a child’s thighs are shorter than the vehicle seat, he or she will slouch. This causes the lap belt to ride up over the stomach. Does the lap belt rest across your child’s upper thighs? If the lap belt rides up on your child’s stomach, there is a risk of serious internal injury or spinal damage in a crash. Is the shoulder belt centred on your child’s shoulder and chest? If the shoulder belt rides across a child’s neck, he or she can be injured, even in a sudden stop. The shoulder belt should never be tucked under a child’s arm.In a collision, the force of the shoulder belt in this position could break ribs, which, in turn, could damage vital organs. The shoulder belt should never be put behind a child’s back. Then, the upper body is unrestrained and the lap belt may rise above the hip bones, which could cause severe or fatal abdominal injuries. Can the child stay seated like this the whole trip? If the child wiggles and squirms, the belt could become mispositioned, riding up on the body. Read and carefully follow the instructions in your vehicle owner’s manual. Set a good example for your child by wearing your own seat belt properly on every trip. The back seat of the vehicle is the safest place for a child. Transport Canada recommends that all children 12 years and under sit in the back seat, especially when there is a front passenger air bag. The lap belt should be over the upper thighs. The shoulder belt should be in the centre of the shoulder and chest. The seat belt helps to spread the force of the crash over the strongest parts of the body. If the belt is not worn correctly, a child can suffer brain or spinal injury, or damage to vital internal organs in a crash. The seat belt should be snug on your child. There should be no more than one finger width between the seat belt and the child’s chest. Encourage your child to sit up straight. Add-on shoulder belt positioning devices which attach to both the lap and shoulder portion of the seat belt are not recommended for children. There are no regulations governing the production or design of these products. Crash test of these add-on devices, done in the U.S., have shown that they may increase the likelihood of injury or death in a crash. They can pull the lap section of the belt up, onto the stomach which can result in serious internal injury in a crash. If you think that a seat belt adjuster is necessary, it is often because the child should be in a booster seat.